Well hello there! Do come and visit me if you get a chance! It is not often one comes across an unexpected treasure of a place for which there is complete lack of publicity and not much information available on the internet either. Kolleru lake turned out to be one such amazingly beautiful spot for birding as well as general sight-seeing. Let me first explain the logistics of getting to the lake and about the different birding spots nearby since this isn’t well documented anywhere. About Kolleru and how to get there? To reach Kolleru, you need to first get to Eluru which is a decent sized town 2-3 hours away from Vijayawada. All in all, it took around 7-8 hours from Hyderabad. Kolleru Lake is a huge lake (20-25kms expanse) which can be visited from different sides. 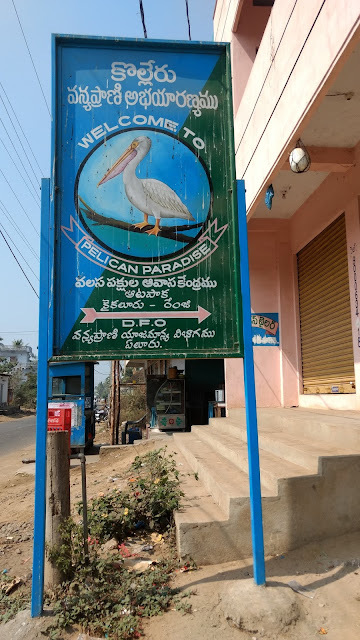 On one side you have the narrow road from Eluru to the erstwhile Haritha Kolleru resort and Kolleti Kota via the Madhavapuram Bird Sanctuary which has numerous resident birds to be seen enroute; the other side has Atapaka Bird Sanctuary which is a huge nesting ground for Pelicans and Painted Storks. The two different sides of the lake (Atapaka and Kolleti Kota) are also connected by a narrow privately-maintained bridge. This route, however is not visible on google maps and directions can be taken only after conversing with locals. One can reach Kolleti Kota after following the Eluru road towards Haritha resort and going further ahead. Some bad (kachha) road notwithstanding, and after crossing a famous temple (Peddintlamma temple), you reach a small, narrow bridge which connects to reach the Bhimavaram side State Highway on which we have Atapaka. A reasonably sized car like Swift can cross that bridge, but an Innova might not be able to do the same. The other way to reach Atapaka is go around the lake (the route that is shown in google maps) and you may not lose much time that ways either. All sign boards in this part of the city are in Telugu and I hope some of these images help identify the different places (as they are very easy to miss). Google Maps link at bottom of this post. Atapaka - Kolleru Bird Sanctuary, Kaikaluru. On Bhimavaram Road NH165. A small sign board, very easy to miss. This one is a difficult question. As far as towns are concerned, one can stay at either Eluru or Bhimavaram which are reasonably close by (within 20-30 kms). 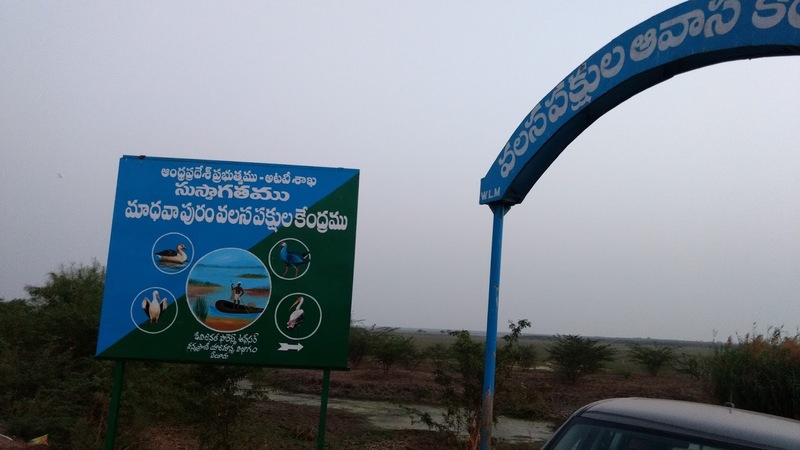 Eluru is close to Madhavapuram or Kolleti Kota, while Bhimavaram is closer to Atapaka Bird Sanctuary. Other than that, the only option (I am aware of, and where we stayed) near the birding spots (Madhavapuram) is Eco Tourism Resort which was originally Haritha Kolleru Resort but no longer maintained by Haritha. For bookings, I can share the contact number of the current owner on request. 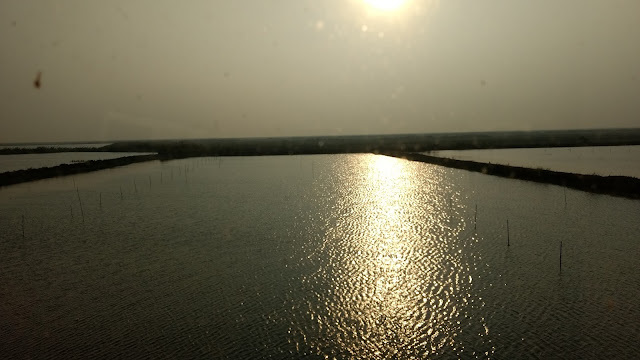 While the resort is decent with Air Conditioning etc, there is a question mark on hygiene since it is built on static water, which while provides for a very pleasant landscape and good view of sunrise/sunset but also gives potential as breeding ground for mosquitoes. So if you stay there, make sure you don’t open windows during the evening. Without further ado, let me highlight the beauty of this amazing lake! We went towards Madhavapuram in the evening which was close by the resort (around 2-3 kms). The next morning, we went to Atapaka, truly a Pelican paradise. You can also do boating there for Rs 300. Camera charges extra. First view of Atapaka - designated location of Kolleru Bird Sanctuary. Family time! Resting mother with her children. A lot of Pelicans and Painted Storks build nests and lay eggs at such places at the beginning of winter. This is towards the end, when the offsprings are already out and growing up fast! Hey you! Don't you dare disturb me, even if you outnumber my species! Pond Heron. Deadly eyes as always! I have as much a right to be photographed, as birds! We went back to Eluru via the Kolleti Kota road and narrow bridge to connect to Eluru. The marshy land also had a lot of different birds. The vacation from https://www.imanali.in/ is the best time which will make you feel that you are in the world of the dreams. This will give you the chance to have some time from your busy schedules to enjoy in your dream city. This will make you feel so much special and comfortable.